4 Orange Marmalade. Use a pound of double refined Sugar to a pound of Oranges. Pare them very thin, cut them in quarters, & take out the pulp. Boil the peels in plenty of water, cover them close, & change the water two or three times. When they are clear & tender dry them in a cloth, & shred them very thin, taking out all the strings. Then boil the Sugar with two or three spoonfuls of water, skimming it well, then put in the peels, and let them boil nearly half an hour. Have ready the pulp, picked clear from the skins & seeds, and the juice of two large lemons. 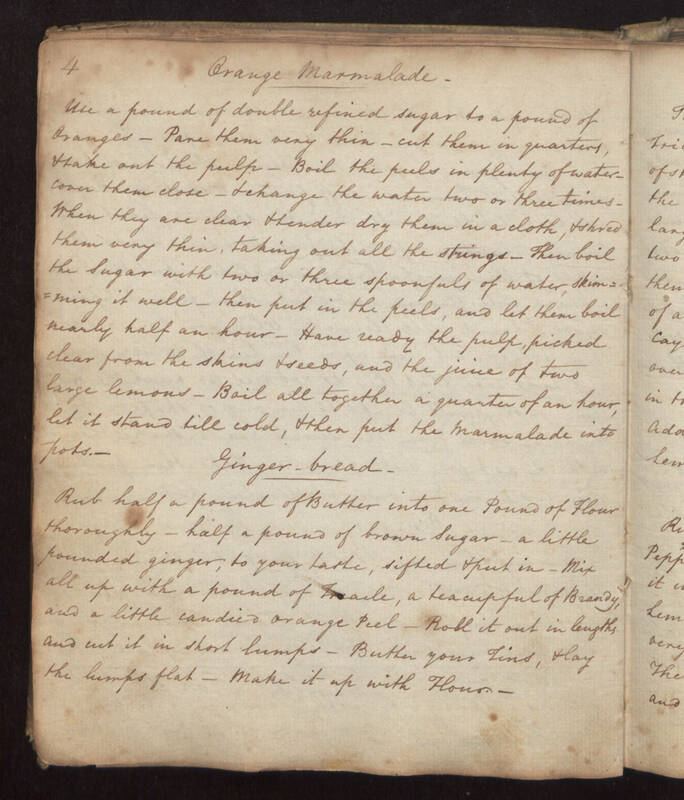 Boil all together a quarter of an hour, let it stand till cold, & then put the marmalade into pots. Ginger-bread Rub half a pound of Butter into one Pound of Flour thoroughly, half a pound of brown Sugar, a little pounded ginger, to your taste, sifted & put in. Mix all up with a pound of Treacle, a tea cupful of Brandy, and a little candied orange Peel. Roll it out in lengths and cut it in short lumps. Butter your Tins, & lay the lumps flat. Make it up with Flour.